There was a time when the famous white shirts used to inspire fear in the hearts of the opposite team. 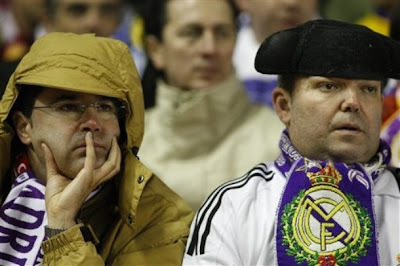 Ironically, white symbolized Peace back then, but the whites at the Santiago Bernabeu symbolized anything but. White still symbolizes Peace, we’re at Peace as well; which is all very good had it not been for the fact that we’ve been eliminated early on in the Copa Del Rey (again!) and have been eliminated in the round of 16 in UCL (again!) for the 5th consecutive time conceding 5 goals over 2 legs in what amounts to as our worst exit from the UCL for some years. Was this expected? I yet have to meet a single madridista who answered “no” with complete vehemence to this question. We all expected this to happen, because we all knew of the problems brewing just under the surface. We kept telling ourselves “If it aint broke, don’t fix it”. What we conveniently tried to ignore that we were indeed broken all this while. La Pelicula, without wings; and we expected it to fly. The loss to Liverpool, as labeled by the press “was on the worst shock defeats for Real Madrid”. 20 bucks should get me through the week. …How fittingly appropriate in the meaning they convey.